This article is about the financial company. For electronic trading, see electronic trading platform. For East Trade Street in Charlotte, see Trade Street. 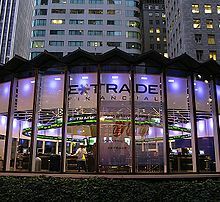 E-Trade Financial Corporation (stylized as E*TRADE) offers an electronic trading platform to trade financial assets including common stocks, preferred stocks, futures contracts, exchange-traded funds, options, mutual funds, and fixed income investments. It also provides services for employee stock ownership plans, advisor services, margin lending, online banking, and cash management services. As of December 31, 2018, the company had 4.9 million brokerage accounts and a total margin receivables balance of $9.560 billion. In 2018, the company processed 282,243 daily average revenue trades. In 2018, 64% of net revenue was from interest income, 17% of net revenue was from commissions for order execution, 15% was from payment for order flow and management services, and 4% was from other sources. The company has 30 branches. The company is organized in Delaware and headquartered in New York City. The company's primary offices are in Alpharetta, Georgia; Jersey City, New Jersey; Arlington, Virginia; Sandy, Utah; Menlo Park, California; and New York City. In 1982, William A. Porter and Bernard A. Newcomb founded TradePlus in Palo Alto, California, with $15,000 in capital. In 1991, Porter and Newcomb founded E-Trade Securities, Inc., with several hundred thousand dollars of startup capital from TradePlus. E*Trade offered its trading services via America Online and Compuserve. In 1994, its revenues neared $11 million, up from $850,000 in 1992. By June 30, 1996, the company had 73,000 accounts and processed 8,000 trades per day, with quarterly revenue of $15 million. In August 16, 1996, the company became a public company via an initial public offering. In May 2001, the company acquired Web Street Securities for $45 million in stock. In January 2004, Toronto-Dominion Bank held talks to merge its TD Waterhouse discount brokerage with E*Trade, but the two sides could not come to an agreement over control of the merged entity. TD Waterhouse instead merged with Ameritrade to form TD Ameritrade. After the merger, E*Trade continued talks to merge with TD Ameritrade but the two sides could not agree on price and governance rights. In August 2005, the company acquired Harrisdirect from Bank of Montreal. Two months later, E*Trade acquired Brown & Company (aka BrownCo) from JPMorgan Chase for $1.6 billion in cash. As a result, E*Trade closed its office in Rancho Cordova, California, on August 31, 2006 and terminated 500 employees. In July 2007, Etrade Australia, which was a separately operated company owned 6% by the company, was purchased by ANZ Bank for $432 million. On November 29, 2007, E-Trade announced a transaction in which Citadel LLC invested $2.5 billion in cash in exchange for the company's securitized subprime mortgages, collateralized debt obligations (CDOs) and second lien loans, as well as 12.5% senior unsecured notes, and 84,687,686 shares of common stock (equal to 19.99% of the then currently outstanding shares). This resulted in a net $2.2 billion reduction in assets on the company's balance sheet. Citadel received a seat on the board of directors pf the company and Mitch Caplan resigned as CEO. In November 2007, the company revoked the brand name license from SBI E*Trade Securities in Japan. In March 2008, E*Trade named Donald Layton, formerly JPMorgan Chase vice chairman, as its new CEO. Layton had joined E*Trade's board of directors in November 2007, at the same time as the Citadel LLC deal. In September 2008, the company sold its Canadian division to Scotiabank for CAD$444 million. In December 2009, Robert Druskin, a former chief operating officer of Citigroup was named interim CEO and chairman. On March 22, 2010, Steven Freiberg was named CEO. Freiberg was the former co-CEO of Citigroup's global consumer group and former head of its credit card unit. On September 12, 2016, E*Trade acquired OptionsHouse for $725 million and Karl A. Roessner was appointed CEO. E*Trade Baby was an integrated advertising campaign that featured a baby that talked about finance. The goal was to make the audience believe that E*Trade was easy to use. The campaign, which appeared online, on television, and in print, was created by Tor Myhren, then of Grey Group. At first, Myhren had doubts if the ad campaign would work. In January 2008, during Super Bowl XLII, the company debuted advertisements featuring the baby, voiced by comedian Pete Holmes, discussing investing in an adult voice in front of a webcam. In February 2009, during Super Bowl XLIII, the company once again aired a 30-second advertisement featuring the baby, along with a Facebook page, updates on Twitter, and videos on YouTube. As a result of the advertisement, the company realized a 19% increase in online applications and an 86% increase in website traffic in the week after the game. In 2011, the baby was featured in an advertisement called “Enzo the Tailor”, in which the baby was fitted for a custom-made suit and talked about how his tailor could retire in Tuscany. In January 2013, the company aired an advertisement during Super Bowl XLVII featuring the baby. In the advertisement, the baby focuses on how much money is at stake in 401(k) account fees and offers a better approach: "come to E*TRADE, and Save It". On March 21, 2014, the company announced the end of the E*Trade baby via a commercial which aired during the NCAA Division I Men's Basketball Tournament. Ajaxo Inc. v. E*Trade Financial Corp.
^ a b "E-Trade Financial Corporation 2018 Form 10-K Annual Report". U.S. Securities and Exchange Commission. ^ "History of E*Trade Financial Corporation". Funding Universe. ^ "E*Trade Financial Corporation Prospectus". E*Trade Financial. August 16, 1996. ^ "E*Trade hits Wall Street". CNET. August 16, 1996. ^ "E-Trade acquires Web Street". American City Business Journals. May 21, 2001. ^ "E-Trade to Buy Web Street for $45 Million". Los Angeles Times. Reuters. May 21, 2001. ^ GELSI, STEVE (May 21, 2001). "Web Street to be bought by E Trade". Marketwatch. ^ Valdmanis, Thor (January 14, 2004). "TD Waterhouse, E-Trade talk merger". USA Today. ^ Goldstein, Steve (August 22, 2007). "E-Trade and TD Ameritrade have discussed merger". Marketwatch. ^ "E-Trade to acquire BrownCo for $1.6B". American City Business Journals. September 30, 2005. ^ "E-Trade to close Rancho Cordova office, lay off 500". American City Business Journals. May 18, 2006. ^ Thurlow, Rebecca (May 16, 2007). "ANZ Bank clears final hurdle in bid to acquire ETrade Australia". Marketwatch. ^ "E*TRADE Financial Announces $2.5 Billion Investment Led by Citadel" (Press release). E*Trade Financial. November 29, 2007 – via U.S. Securities and Exchange Commission. ^ Yerak, Becky (November 30, 2007). "Citadel boosts E-Trade stake with $2.5 billion investment". Chicago Tribune. ^ "E*TRADE Financial and SBI E*TRADE Announce Termination of Branding Agreement in Japan" (Press release). E*Trade Financial. November 9, 2007 – via Business Wire. ^ "E*TRADE Financial Appoints Chairman Donald H. Layton Chief Executive Officer" (Press release). E*Trade Financial. March 3, 2008 – via Business Wire. ^ "E*Trade Chairman Layton adds CEO post". Reuters. March 2, 2008. ^ "Scotiabank Completes Acquisition of E*TRADE Canada" (Press release). Scotiabank. September 22, 2008. ^ "Scotiabank buys E*Trade Canada". CBC News. July 14, 2008. ^ "E-Trade names director as chairman, interim CEO". San Diego Union Tribune. Associated Press. December 21, 2009. ^ "E*TRADE Financial Appoints Steven Freiberg Chief Executive Officer" (Press release). E*Trade Financial. March 22, 2010 – via Business Wire. ^ "E*TRADE Financial Appoints Paul T. Idzik Chief Executive Officer" (Press release). E*Trade Financial. January 17, 2013 – via Business Wire. ^ "E*TRADE Financial Corporation Announces Leadership Transition with Close of OptionsHouse Transaction" (Press release). E*Trade Financial. September 12, 2016 – via Business Wire. ^ O'Reilly, Lara (December 17, 2015). "The guy who made the E-Trade baby ads is now in charge of advertising at Apple". Business Insider. ^ Carr, Austin (February 2, 2011). "Super Bowl Ad Stories: The eTrade Baby Was a Happy Accident". Fast Company. ^ Lugmayr, Luigi (January 27, 2009). "ETrade Talking Baby Super Bowl Ad is Back and on Twitter". I4U News. ^ Steinberg, Brian (January 25, 2010). "WHY THIS $3 MILLION BABY IS BACK ON THE SUPER BOWL". Advertising Age. ^ "E*TRADE Unveils Super Bowl® XLVII Advertisement" (Press release). E*Trade Financial. February 1, 2013. ^ "E-Trade bids goodbye to its iconic baby". CNBC. Reuters. March 21, 2014.